Thymic stromal lymphopoietin was recently identified as a master switch for the development of allergen-driven Th2 responses. However, the role of thymic stromal lymphopoietin (TSLP) in the development of helminth-induced Th2 responses is unclear. Here, using TSLPR−/− mice, we show that while TSLPR signaling participates in the development of Schistosoma mansoni egg-induced CD4+ Th2 responses, it plays only a transient role in the development of Th2-dependent pathology in the lung, liver, and intestine. 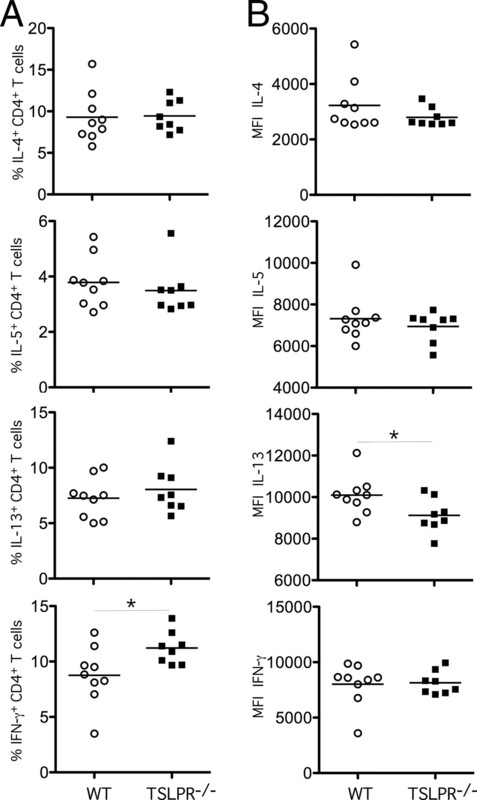 Studies conducted in a pulmonary granuloma model showed that while a reduction in IL-4/IL-13-dependent granulomatous inflammation and tissue eosinophilia was observed in TSLPR−/− mice undergoing a primary response, lesion formation was not affected during a secondary granulomatous response, even though IL-5 and IL-13 were modestly reduced in the knockout mice. To evaluate the importance of TSLPR signaling in the development of a chronic Th2-dependent response, TSLPR−/− mice were also infected with S. mansoni cercariae. Here, the only significant difference noted in TSLPR−/− mice was a modest decrease in liver fibrosis in acutely infected animals. The transient decrease in fibrosis was associated with increased production of the antifibrotic cytokine IFN-γ and decreased production of the profibrotic cytokine IL-13. Although the altered cytokine response persisted in chronically infected TSLPR−/− mice, it failed to reduce granuloma formation or fibrosis, confirming that TSLPR signaling plays a limited role in the development of chronic Th2-dependent pathology. Collectively, these findings suggest that while TSLPR signaling serves a key role in allergen-driven Th2 responses, it exerts minor regulatory activity during this chronic helminth infection. Thymic stromal lymphopoietin (TSLP)4 is a secreted protein of 140 aa that was originally shown to support B cell development (1, 2, 3). Since then, a variety of functions have been described for TSLP (4, 5, 6, 7, 8). TSLP signaling is mediated by a functional heteromeric receptor complex composed of the TSLPR and the IL-7R α-chain (9, 10). Because the receptor complex is principally expressed on monocytes and dendritic cell (DC) populations, TSLP is thought to target the activity of myeloid cells. In addition to enhancing CD40 and CD80 expression on CD11c+ DCs, TSLP increases the capacity of DCs to stimulate the proliferation of naive CD4+ T cells (11), promotes the expansion and survival of T cells (12), and maintains DC cell-mediated T cell homeostasis (13). It also triggers the release of T cell-attracting chemokines from monocytes. Thus, in addition to influencing B cell development, TSLP regulates numerous DC and monocyte activities. Epithelial cells are the predominant producers of TSLP (14, 15), although basophils have also been identified as an important source (16). While early studies illustrated a role for TSLP/TSLPR signaling in the activation of naive T cells by DCs (7, 11, 13), subsequent studies suggested that TSLP preferentially induces Th2-type responses. TSLP-activated CD11c+ DCs predominantly secrete Th2 cell-attracting chemokines (14). They also stimulate the production of proallergic Th2-type cytokines from CD4+ (14, 17, 18) and CD8+ T cells (19, 20). In addition to priming CD4+ Th2 cells, TSLP-activated DCs are also involved in the maintenance and polarization of Th2 responses (21). While DCs are clearly important targets of TSLP, recent studies showed that TSLP could also directly induce IL-4 production in CD4+ T cells (22) and mast cells (23). Th2 cytokines, in turn, amplify the production of TSLP by epithelial cells, illustrating a positive feedback loop in the promotion of Th2 responses by TSLP (24). TSLP was detected in the bronchial biopsies of asthmatic individuals (25) and in the lungs of mice undergoing allergen-induced asthma (26, 27). The development of asthma is attenuated in TSLPR-deficient animals (26, 27), and TSLP-induced inflammation is reduced in the absence of IL-4 and IL-13 (28, 29), confirming a critical role for TSLP/TSLPR signaling in the development of Th2-dependent inflammation in the lung and skin (4, 5, 6, 7, 8). Like many allergic responses, infection with most helminth parasites is associated with the development of a robust Th2-type response (30, 31). Nevertheless, the role of TSLP/TSLPR signaling in the development of helminth-induced Th2-type immunity remains unclear. In the mouse model of schistosomiasis, parasite eggs induce a profound granulomatous inflammatory response in the gut and liver, which is characterized by the recruitment of a large population of eosinophils (32). The resulting immune response is associated with the production of several Th2 cytokines, including IL-4, IL-5, IL-13, and IL-21, which contribute to the development of chronic pathology (33, 34, 35, 36). In human schistosomiasis, liver fibrosis and portal hypertension are primary causes of chronic morbidity and mortality, and Th2 cytokines have been shown to play a critical role (32, 37, 38). Consequently, the mouse model of schistosomiasis is an ideal system to study the pathogenesis of the human disease and the mechanisms of Th2 cytokine-driven pathology more generally. Studies with genetically modified mice have shown that the egg-induced inflammatory response is dependent on IL-4 and IL-13 signaling through the type I and type II IL-4 receptors, while fibrosis is predominantly driven by IL-13 and the type II IL-4 receptor (34, 39, 40, 41). Because TSLP was shown to be a critical mediator of allergen-induced Th2-dependent inflammation, in the present studies, we examined whether TSLP/TSLPR signaling was required for the initiation and/or maintenance of helminth-induced Th2 responses. To investigate the function of the TSLP pathway, TSLPR−/− mice were compared with wild-type (WT) mice following both acute and chronic infection with Schistosoma mansoni. Additionally, S. mansoni eggs were injected into the lungs of naive and egg-sensitized mice to determine whether there were any tissue-specific differences in TSLP function. Additional studies were performed with a neutralizing TSLP-specific mAb to confirm the results with the genetically modified mice. Our findings demonstrate that TSLP signaling is involved in the development of polarized Th2 cytokine responses and for the optimal development of primary granulomas in the lung, but it is not necessary for secondary granulomatous inflammation or for the formation of Th2-dependent pathology in the liver and gut during a chronic S. mansoni infection. The TSLPR−/− mice were generated as described (27). All mice were housed under specific pathogen-free conditions at the National Institutes of Health in an American Association for the Accreditation of Laboratory Animal Care approved facility. The National Institute of Allergy and Infectious Diseases Animal Care and Use Committee approved all experimental procedures. For infections, mice were percutaneously exposed via the tail with 30–35 cercariae of a Puerto Rican strain of S. mansoni (Naval Medical Research Institute) that were obtained from infected Biomphalaria glabrata snails (Biomedical Research Institute, Rockville, MD). All mice were perfused at the time of sacrifice, and worm and tissue egg burdens were determined. For the induction of synchronous primary pulmonary granulomas, mice were given 5000 eggs i.v. For the induction of secondary granulomas, mice were sensitized i.p. with 5000 live eggs and then challenged with 5000 live eggs i.v (42). The neutralizing mAb to TSLP (Amgen) and control rat IgG2a were used at 200 μg/dose twice each week. Pulmonary and hepatic granuloma measurements from schistosome-exposed or i.v. egg-injected mice were determined from histological sections stained with Wright’s Giemsa (Histopath of America, Clinton, MD). Thirty granulomas per mouse were included in all analyses of schistosome granulomas. The number of schistosome eggs in the liver and the gut and the collagen content of the liver, as measured by hydroxyproline levels, were determined as previously described (33). Specifically, hepatic collagen was measured after hydrolysis of a 200-mg portion of liver in 5 ml of 6 N HCl at 110°C for 18 h. The increase in hepatic hydroxyproline was positively related to egg numbers in all experiments, and hepatic collagen is reported as the increase above normal liver collagen in micromoles per 10,000 eggs: [(infected liver collagen − normal liver collagen)/liver eggs] × 10−4 or micromoles per 10,000 eggs. The same individual scored all histological features and had no knowledge of the experimental design. Roughly 200 mg of granulomatous lung or liver tissue was disrupted into a single-cell suspension by grinding through a 70-μm nylon mesh (41). The WBCs from liver cells were separated on a 34% Percoll gradient (350 × g for 20 min) (Sigma-Aldrich). Mesenteric lymph node and liver WBCs were treated with 2 ml of ACK lysis buffer (Quality Biological) for 2 min. For intracellular cytokine cytometry, leukocytes were stimulated with PMA (10 ng/ml), ionomycin (1 μg/ml), and brefeldin A (10 μg/ml) (Sigma-Aldrich) for 3 h. Cells were fixed in 2% formaldehyde for 20 min at room temperature, permeabilized with 0.1% saponin buffer (Sigma-Aldrich), and stained with the following cocktail of Abs: IL-13 FITC (Centocor Ortho Biotech), CD4 Pacific Blue, IL-4 PE, IL-5 allophycocyanin (BD Biosciences), IFN-γ PE-Cy7 (eBioscience) and acquired with FACSCanto II (BD Biosciences). Data were analyzed using FlowJo v7.2 software. Individual sample RNA (0.1 μg) was reverse-transcribed using SuperScript II (Invitrogen) and a mixture of oligo(dT) and random primers. Real-time PCR was performed on an ABI Prism 7900 sequence detection system (Applied Biosystems). Relative quantities of mRNA for several genes was determined using SYBR Green PCR Master Mix (Applied Biosystems) and by the comparative threshold cycle method as described by Applied Biosystems for the ABI Prism 7700/7900 sequence detection systems. In this method, mRNAs for each sample were normalized to hypoxanthine guanine phosphoribosyltransferase (HPRT) mRNA amounts and then expressed as a relative increase or decrease compared with uninfected controls (35). Hepatic fibrosis (adjusted for egg number) decreases with increasing intensity of infection (worm pairs). Therefore, these variables were compared by analysis of covariance, using the logarithm of total liver eggs as the covariate and the logarithm of hydroxyproline content per egg. All other data were analyzed with GraphPad Prism (version 5; GraphPad Software). Data were considered statistically significant for p values of <0.05, obtained with a two-tailed t test. Five thousand viable eggs of the Th2-inducing pathogen S. mansoni were injected i.v. into the lungs of naive or i.p. egg-sensitized WT mice to determine whether TSLP, TSLPR, or the IL-7Ra chain were induced in the lung following egg exposure (Fig. 1⇓). Although there was minimal induction of TSLP mRNA during primary and secondary granulomatous inflammation (Fig. 1⇓A), significant increases in the TSLP receptor components were observed in the lung, particularly in mice undergoing a secondary response (Fig. 1⇓, B and C). Next, we investigated whether TSLP signaling was required for the development of primary or secondary pathogen-induced Th2 responses (Fig. 2⇓). Lymphocytes were isolated from the granulomatous lungs of WT BALB/c and TSLPR−/− mice on day 7 after i.v. egg injection and intracellular cytokine staining was performed for IL-4, IL-5, IL-13, and IFN-γ. Consistent with the described role of TSLP in maintaining DC-mediated T cell homeostasis (13), a significant reduction in the percentage of CD4+ T cells was observed in the lungs of TSLPR−/− mice undergoing both primary and secondary granuloma formation (Fig. 2⇓A). Despite the overall reduction in CD4+ T cells, however, the percentage of IL-4-, IL-5-, and IL-13-producing CD4+ T cells observed in TSLPR−/− mice was similar to WT mice during the primary granulomatous response (Fig. 2⇓B). The percentage of IFN-γ producers also did not change, suggesting that the TSLPR was having no significant impact on the early development of the primary egg-induced Th2 response. In fact, the mean fluorescence intensity (MFI) for IL-4 increased in the TSLPR−/− mice (Fig. 2⇓C), suggesting that their CD4+ T cells were producing slightly more IL-4 on a per cell basis. As expected, the secondary granulomatous response was associated with a much stronger CD4+ Th2 cell response. However, in contrast to the primary response, the TSLPR−/− mice undergoing a secondary challenge showed a modest but significant reduction in the percentage of IL-4-, IL-5-, and IL-13-producing CD4+ T cells. The percentage of IFN-γ producers also increased slightly in the knockout mice (Fig. 2⇓B) and the MFI for IL-4 was reduced (Fig. 2⇓C), suggesting that the TSLPR was contributing to the polarization of the secondary egg-induced Th2 response. Regulation of TSLP, TSLPR, and IL-7Rα mRNA expression in the lung. Naive S. mansoni i.v. egg-challenged (primary) and i.p. egg-sensitized and -challenged (secondary) WT mice were sacrificed on day 7 after i.v. egg challenge. The lungs were analyzed individually for tslp (A), tslpr (B), and il7ra (C) mRNA expression by real-time PCR. Fold changes (mean ± SEM) are based on comparisons of naive mice with egg-injected animals (n = 5/group). Statistically significant differences are noted in the figures. Similar results were obtained in a second experiment. The frequency of Th2 cytokine-producing cells is reduced in the lungs of TSLPR−/− mice. Naive S. mansoni i.v. egg-challenged (primary) and i.p. egg-sensitized and -challenged (secondary) WT and TSLPR−/− mice were sacrificed on day 7 after i.v. egg challenge. Lung leukocytes were isolated, separated, counted, and cultured with PMA, ionomycin, and brefeldin A for 3 h and analyzed for ex vivo cytokine production capability. A, Total percentage of CD4+ T cells in the lung leukocyte preparation. 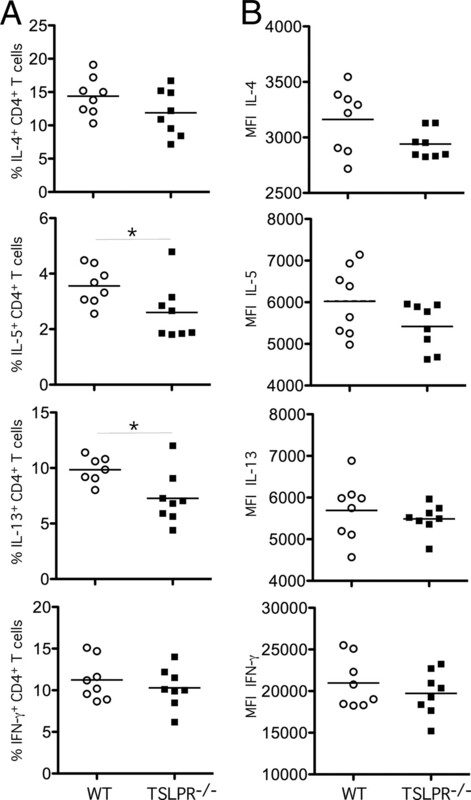 B, Total number of IL-4-, IL-5-, IL-13-, and IFN-γ-producing CD4+ T cells in the lung leukocyte preparation. C, Magnitude of cytokine production by CD4+ T cells displayed as geometric mean of fluorescence intensity. Statistically significant differences are shown. ∗, p < 0.05; ∗∗, p < 0.01; and ∗∗∗, p < 0.001. All experiments were repeated twice with similar results. Because the Th2 response was reduced in the lungs of mice challenged with S. mansoni eggs, we examined whether granuloma formation was affected by the TSLPR deficiency. For these studies, naive and S. mansoni egg sensitized WT and TSLPR−/− mice were challenged i.v. with 5000 live S. mansoni eggs, and the sizes of granulomas in mice undergoing a primary and secondary response were measured microscopically in the lungs on day 7 postchallenge (43). Unexpectedly, although there was no obvious decrease in the CD4+ Th2 response in the tissues (Fig. 2⇑B), TSLPR−/− mice undergoing primary granuloma formation displayed a 40–50% reduction in granuloma volume (Fig. 3⇓A). The reduction in lesion formation was accompanied by a significant decrease in the number of granuloma-associated eosinophils (Fig. 3⇓B). In contrast, while TSLPR−/− mice undergoing secondary granuloma formation displayed a significant decrease in CD4+ Th2 cytokine expression (Fig. 2⇑B), their granulomas were indistinguishable from WT lesions (Fig. 3⇓, A and B). Pulmonary granuloma experiments conducted with a TSLP-neutralizing mAb produced comparable results (Fig. 3⇓, C and D). 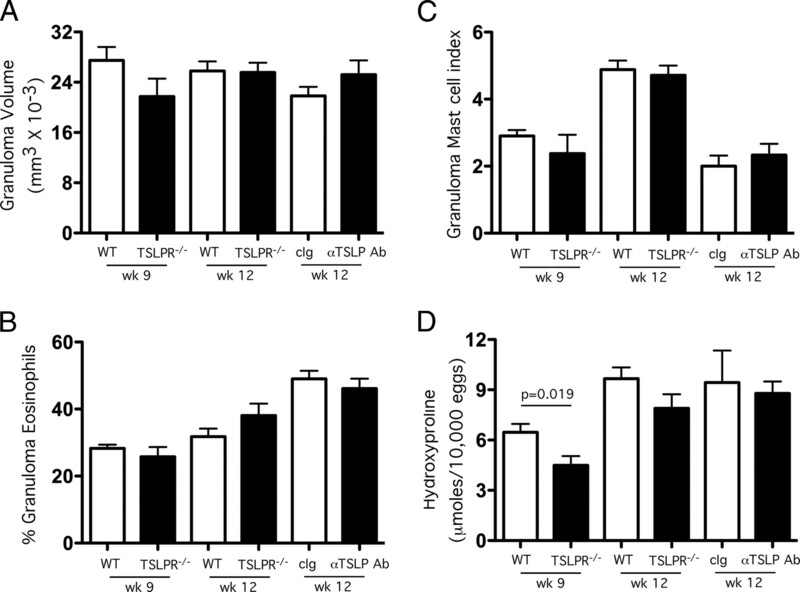 Primary granulomatous inflammation is reduced in TSLPR−/− mice. Naive S. mansoni i.v. egg-challenged (primary) and i.p. egg-sensitized and -challenged (secondary) WT and TSLPR−/− mice were sacrificed on day 7 after i.v. egg-challenge. The left lobes from each mouse (primary WT (n = 6), primary TSLPR−/− (n = 8), secondary WT (n = 9), Secondary TSLPR−/− (n = 10)) were examined histologically to evaluate the size of granulomas as a measure of inflammation (A) and the percentage of granuloma-associated eosinophils (B). A separate group of WT animals was treated twice per week at 200 μg with control Ab (c Ig) or with a neutralizing mAb specific for TSLP (Amgen) during the 7 days following the i.v. egg challenge, and granuloma size was measured (C) and eosinophils were enumerated (D) in individual mice (primary WT (n = 10), primary TSLPR−/− (n = 9), secondary WT (n = 8), secondary TSLPR−/− (n = 10)). Statistically significant differences and the corresponding p values are noted in the figures. The results shown are pooled data from two separate experiments. Next, we examined whether TSLP signaling regulates Th2-dependent granuloma formation and fibrosis in the liver during S. mansoni infection (34, 44). For these studies, WT and TSLPR−/− mice were infected percutaneously with S. mansoni cercariae, and granuloma size and fibrosis were measured at 9 and 12 wk postinfection. Similar to the results observed in the lung, while there was little induction of TSLP mRNA during infection (Fig. 4⇓A), there was a significant increase in both receptor subunits at 9 and 12 wk postinfection (Fig. 4⇓, B and C). While there was a slight decrease in granuloma size in the TSLPR−/− mice at 9 wk postinfection, the difference with WT granulomas was not significant (Fig. 5⇓A). Moreover, by wk 12 the size of the TSLPR−/− lesions was indistinguishable from WT. Similar results were obtained in WT mice treated with anti-TSLP mAb (Fig. 5⇓A). The number of eosinophils (Fig. 5⇓B) and mast cells (Fig. 5⇓C) in the granulomas was also similar in WT and TSLPR−/− mice at 9 and 12 wk postinfection, indicating that the TSLPR deficiency had no major effect on the cellular composition of the inflammatory response (Fig. 5⇓B). The only significant difference noted in the TSLPR−/− mice was an ∼30% reduction in liver fibrosis at 9 wk postinfection (Fig. 5⇓D). Because epithelial cells that line mucosal tissues (15) produce TSLP, we also examined whether the absence of TSLPR was affecting granuloma formation in the gut. Consistent with the results observed in the liver, the granulomas in the small intestines of infected TSLPR−/− mice were of a similar size (Fig. 6⇓A) and composition (Fig. 6⇓B) as the WT lesions. There were also no diffuse inflammatory changes in the small intestine at 9 and 12 wk postinfection (not shown). The development of pathology in the liver and gut was not associated with any significant change in the infectious burden, as assessed by the worm and tissue egg counts at 9 and 12 wk postinfection (Table I⇓). Taken together, these data indicate that the TSLPR has no significant effect on the intensity of S. mansoni infection or on the development of egg-induced Th2-dependent pathology. TSLP, TSLPR, and IL-7Rα mRNA expression in liver following infection. Naive, 9 wk, and 12 wk S. mansoni-infected mice were sacrificed and their livers were analyzed individually for tslp (A), tslpr (B), and il7ra (C) mRNA expression by real-time PCR. Fold changes (mean ± SEM) are based on comparisons of naive uninfected mice with infected animals (n = 4–6 mice/group). Statistically significant differences are noted in the figures. Similar results were obtained in a second experiment. Fibrosis is reduced in 9 wk infected TSLPR−/− mice. A, Control WT BALB/c mice (n = 10 for wk 9, n = 17 for wk 12), TSLPR−/− (n = 8 for wk 9, n = 14 for wk 12) mice, and WT mice treated with control Ab (c Ig) (n = 5) or anti-TSLP Ab (n = 9) (200 μg/day, twice weekly for a total of 4 wk from wk 8–12 postinfection) were infected with 30–35 S. mansoni cercariae percutaneously. Mice were sacrificed on wk 9 or wk 12 postinfection and the livers were analyzed to evaluate the size of granulomas (mean granuloma volume ± SEM) as a measure of inflammation. The percentage of granuloma-associated eosinophils (B) and the mast cell indexes (scale of 1–7) (C) were both evaluated microscopically (means ± SEM). The hydroxyproline content of liver biopsies was also assayed as a quantitative measure of fibrosis (D). Hydroxyproline values were normalized to the numbers of eggs deposited in the liver. Statistically significant differences and the corresponding p values are noted in the figures. Similar results were obtained in three separate studies. Granuloma formation in the small intestine is not affected by TSLPR deficiency. A, Control WT BALB/c mice (n = 10) and TSLPR−/− (n = 8) mice were infected with 30–35 S. mansoni cercariae percutaneously. Mice were sacrificed on wk 9 and the small intestines were analyzed to evaluate the size of granulomas (mean granuloma volume ± SEM). B, The percentage of granuloma-associated eosinophils was also evaluated microscopically (means ± SEM). Similar results were obtained in a second study. To determine whether TSLPR signaling was regulating the development of the Th2 response following infection with S. mansoni, lymphocytes were isolated from the granulomatous livers at 9 and 12 wk postinfection and intracellular cytokine staining was performed for IL-4, IL-5, IL-13, and IFN-γ as markers of Th2- and Th1-type responses. While no significant differences were noted in the frequency of Th2 cytokine-producing cells on wk 9 (Fig. 7⇓A), we detected a consistent and significant increase in the percentage of IFN-γ-producing CD4+ T cells in the TSLPR−/− mice (Fig. 7⇓A) and reduction in the MFI for IL-13 (Fig. 7⇓B). Because IFN-γ and IL-13 exhibit anti- and profibrotic activity, respectively (34, 45), these findings likely explain the transient yet significant decrease in fibrosis in TSLPR−/− mice at 9 wk postinfection (Fig. 5⇑D). Surprisingly, although we observed a modest and significant decrease in IL-5- and IL-13-producing CD4+ T cells in the liver on wk 12 (Fig. 8⇓), this was not associated with a consistent reduction in Th2-dependent pathology (Figs. 5⇑ and 6⇑). To confirm these findings, we also isolated liver RNA samples from 12 wk infected mice and analyzed the changes in IL-4, IL-13, and IFN-γ mRNA as well as the expression of three IL-4/IL-13/Stat6-inducible genes, including Chi3l3 (Ym1), Retnla (Fizz1/Relm-α), and Il13ra2 (IL-13 receptor α2) by real-time PCR. Here again, the only significant difference noted between the WT and TSLPR−/− mice was an ∼2-fold decrease in IL-4 mRNA expression in the TSLPR−/− mice (Fig. 9⇓). The combined results from these studies suggest that TSLPR signaling plays a minor role in the establishment and maintenance of Th2 responses following infection with the helminth parasite S. mansoni. Th1/Th2 cytokine production in the livers of acutely infected TSLPR−/− mice. Liver leukocytes isolated from 9 wk S. mansoni-infected WT and TSLPR−/− mice were separated, counted, and cultured with PMA, ionomycin and brefeldin A for 3 h and analyzed for ex vivo cytokine production capability. A, Total number of cytokine producing CD4+ T cells in the liver leukocyte preparation. B, Magnitude of cytokine production by CD4+ cells displayed as geometric mean of fluorescence intensity. Statistically significant differences are shown. ∗, p < 0.05. The experiment was repeated twice with similar results. Th1/Th2 cytokine production in the livers of chronically infected TSLPR−/− mice. Liver leukocytes isolated from 12 wk S. mansoni-infected WT and TSLPR−/− mice were separated, counted, and cultured with PMA, ionomycin and brefeldin A for 3 h and analyzed for ex vivo cytokine production capability. A, Total number of cytokine-producing CD4+ T cells in the liver leukocyte preparation. B, Magnitude of cytokine production by CD4+ cells displayed as geometric mean of fluorescence intensity. Statistically significant differences are shown. ∗, p < 0.05. The experiment was repeated twice with similar results. mRNA analysis of Th2 cytokines and IL-4/IL-13/Stat6-inducible genes in the livers of S. mansoni-infected TSLPR−/− mice. Control WT BALB/c mice (n = 10) and TSLPR−/− (n = 8) mice were infected with 30–35 S. mansoni cercariae percutaneously. Mice were sacrificed on wk 9 and the livers were analyzed individually for il4, il13, and ifng as prototypic markers of Th1/Th2 responses (A), and Chi3l3, Retnla, and il13ra2 were measured as markers of IL-4/IL-13-inducible genes (B). Fold changes (mean ± SEM) are based on comparisons of infected mice with naive mice (n = 5). Statistically significant differences are noted in the figures. ∗∗, p < 0.01. Similar results were obtained in a second study. There is strong evidence that TSLP is required for the development of allergen-driven Th2 responses. TSLP is produced by epithelial cells at the site of allergen entry and regulates the activation status of DCs. It induces CD40 and CD80 expression on DCs, triggers the production of the Th2-attracting chemokines TARC and MDC, and grants DCs the ability to prime naive CD4+ T cells to proliferate and produce IL-5 and IL-13 (14). These characteristics identified TSLP as a critical inducer of Th2-type responses (7, 46). In support of this conclusion, mice expressing an inducible TSLP transgene in the skin developed an atopic dermatitis-like inflammatory response, which was associated with Th2 cytokine production and elevated serum IgE levels (47). 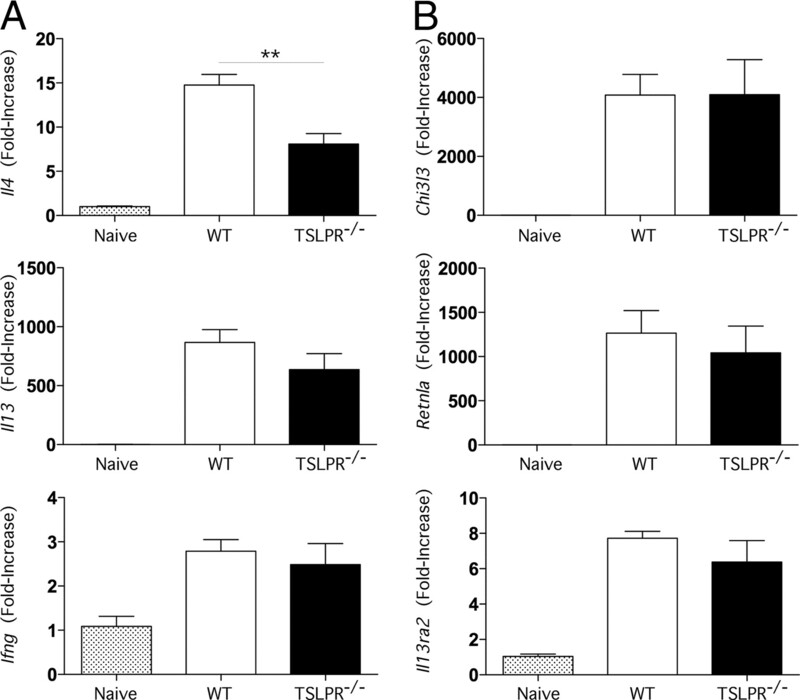 Studies with TSLPR-deficient mice and TSLP-neutralizing mAbs also demonstrated that TSLP signaling is required for the development of allergen-driven inflammatory responses in the lung and skin (4, 26, 27). Indeed, several studies have suggested that TSLP signaling is critical to the generation of Th2 responses (14, 27, 29, 36, 46). While our studies support a role for TSLP/TSLPR signaling in the priming of helminth-induced Th2 responses, the TSLPR played little to no role in the development of Th2-dependent pathology during infection with S. mansoni. As such, these data indicate that TSLP participates in the initiation but is largely dispensable for the development of functional Th2 responses during chronic S. mansoni infection. Differences between TSLP-dependent allergic responses and TSLP-independent pathology during helminth infection are unclear, although a possible explanation may be the different routes of Ag exposure in each case. Stromal cells such as keratinocytes and epithelial cells are the primary producers of TSLP (7, 8, 46). While allergens typically target these tissues, S. mansoni eggs are predominantly found in the microvasculature of the gut and liver. Although the parasite’s eggs transit through the wall of the intestine on their way to the intestinal lumen, and immature parasites spend a brief period migrating through the skin and lungs following infection, schistosomes spend most of their lives in the vasculature of their vertebrate host. Thus, in contrast to allergens that primarily affect mucosal tissues, infection with S. mansoni causes damage to numerous tissues including the epithelium and endothelium as well as several organ systems including the skin, lung, liver, and intestine. Consequently, a variety of mechanisms involving numerous cell types have been implicated in the generation and maintenance of the systemic Th2 response that occurs during helminth infection (16, 31, 48, 49), perhaps putting less of a demand on the TSLP pathway. Thus, TSLP does not appear to function as a master switch for all Th2-driven inflammatory responses (5), but rather it plays more of a selective role in the development of Th2 responses that occur exclusively in epithelial tissues. Consistent with this model, He et al. has found that epicutaneous sensitization requires TSLP responsiveness, while more systemic responses may not (4). Recent studies showed that the downstream effects of TSLP are IL-4Rα1- and Stat6-dependent (28, 29). Indeed, all of the pathological changes triggered by TSLP in the lung and skin were dependent on the Th2 cytokines IL-4 and IL-13, including airway hyperresponsiveness, airway inflammation, tissue eosinophilia, goblet cell metaplasia, circulating IgE and IgG1 responses, epithelial hyperplasia, and subcuticular fibrosis. Consequently, these authors proposed a stepwise pathway for the development of allergen-driven pathology, which involves TSLP and the downstream mediators IL-4 and IL-13. Given this conclusion, the findings with the schistosome lung model were unexpected since the formation of S. mansoni egg-induced granulomas is also highly dependent on IL-4 and IL-13 (50, 51). 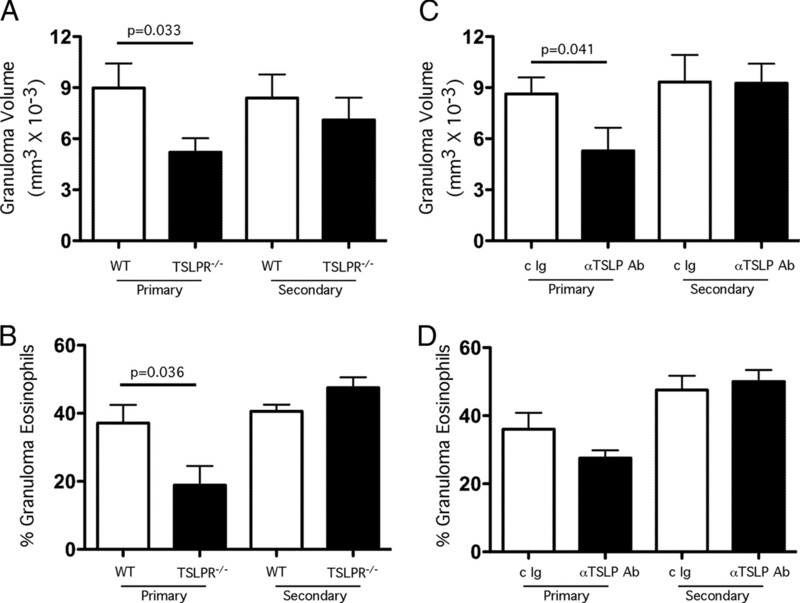 We hypothesized that if the TSLP/TSLPR signaling pathway was playing a critical role in the lung, granuloma size would be decreased in the TSLPR−/− mice. In support of this hypothesis, we observed a marked and highly significant reduction in granulomatous inflammation and tissue eosinophilia in TSLPR−/− mice undergoing primary granuloma formation. Nevertheless, while production of IL-4, IL-5, and IL-13 was modestly reduced in TSLPR−/− mice undergoing a secondary granulomatous response, lesion formation was not diminished in these animals. We also found no significant reduction in the number of granuloma-associated eosinophils. Identical findings were also generated with a TSLP blocking Ab. These results suggest that while TSLP plays a significant role in the initial development of IL-4/IL-13-dependent inflammation, it is not critically required for the formation or maintenance of secondary Th2 effector responses in the lung. To further investigate the importance of TSLP in the development and maintenance of chronic Th2 responses, we also infected TSLPR−/− mice with S. mansoni cercariae and examined the development and progression of schistosomiasis-associated pathology after 9 and 12 wk of infection. In contrast to other helminth infections where subtle differences in the developing immune response can have a major impact on susceptibility to infection (30), the establishment of S. mansoni infection is almost never altered by changes in the host immune response in naive unvaccinated hosts (31, 52). Instead, changes in the host immune response regulate the severity of the disease, with highly polarized Th1/Th17 responses causing significant acute morbidity and mortality characterized by the development of hepatotoxicity and endotoxemia (53, 54, 55) and highly polarized Th2 responses triggering chronic morbidity and mortality associated with liver fibrosis, portal hypertension, and bleeding from collateral vessels (34, 44, 54). Consequently, the murine model of schistosomiasis is an ideal system to dissect the pathogenesis of Th2-driven inflammatory responses because the number of parasites is not significantly altered by changes in the immune response, which is a variable in studies with other helminth parasites (15). In agreement with this conclusion, no significant differences in the worm or tissue egg burdens were noted between the WT and TSLPR−/− mice. The only significant difference noted between the two groups was a small decrease in liver fibrosis at 9 wk postinfection in the TSLPR−/− mice, which was not seen in chronically infected animals. The decrease in fibrosis was associated with increased IFN-γ-producing CD4+ T cells in the liver and a small decrease in the production of IL-13, which was consistent with the respective anti- and profibrotic activities of IFN-γ and IL-13 (34, 45, 56). Although a small decrease in IL-13-producing T cells persisted in chronically infected TSLPR−/− mice, this did not translate into a significant change in the inflammatory or fibrotic responses, confirming that TSLPR signaling was playing a limited role in the development of chronic Th2 pathology in the liver. Similar observations were noted in the small intestine. Thus, while TSLP is a critical and indispensable master switch for some allergen-driven Th2 responses (5, 14, 26, 27, 47, 57, 58), our findings suggest it plays a limited role in the initiation and maintenance of Th2 responses during chronic schistosome infection. Indeed, other cytokines, such as IL-4, IL-21, and IL-25, have been shown to exert a more prominent role in the development of helminth-induced Th2 responses (35, 59, 60, 61, 62). Thus, it seems more likely that a variety of mechanisms, including the TSLP/TSLPR pathway, are working together to optimally induce Th2 effector function during chronic helminth infection. The authors thank Dr. Fred Lewis and his colleagues at Biomedical Research Institute (Rockville, MD) for all schistosome materials. ↵1 This research was supported by the Intramural Research Program of the National Institutes of Health, National Institute of Allergy and Infectious Diseases (to T.A.W.) and by National Institutes of Health Grants AI068731 and AR056113 (to S.F.Z.). ↵2 T.R.R. and J.T.P. contributed equally to this work. ↵4 Abbreviations used in this paper: TSLP, thymic stromal lymphopoietin; DC, dendritic cell; MFI, mean fluorescence intensity; WT, wild type. Levin, S. D., R. M. Koelling, S. L. Friend, D. E. Isaksen, S. F. Ziegler, R. M. Perlmutter, A. G. Farr. 1999. Thymic stromal lymphopoietin: a cytokine that promotes the development of IgM+ B cells in vitro and signals via a novel mechanism. J. Immunol. 162: 677-683. Ray, R. J., C. Furlonger, D. E. Williams, C. J. Paige. 1996. Characterization of thymic stromal-derived lymphopoietin (TSLP) in murine B cell development in vitro. Eur. J. Immunol. 26: 10-16. Sims, J. E., D. E. Williams, P. J. Morrissey, K. Garka, D. Foxworthe, V. Price, S. L. Friend, A. Farr, M. A. Bedell, N. A. Jenkins, N. G. Copeland, K. Grabstein, R. J. Paxton. 2000. Molecular cloning and biological characterization of a novel murine lymphoid growth factor. J. Exp. Med. 192: 671-680. He, R., M. K. Oyoshi, L. Garibyan, L. Kumar, S. F. Ziegler, R. S. Geha. 2008. TSLP acts on infiltrating effector T cells to drive allergic skin inflammation. Proc. Natl. Acad. Sci. USA 105: 11875-11880. Liu, Y. J.. 2006. Thymic stromal lymphopoietin: master switch for allergic inflammation. J. Exp. Med. 203: 269-273. Shi, L., S. W. Leu, F. Xu, X. Zhou, H. Yin, L. Cai, L. Zhang. 2008. Local blockade of TSLP receptor alleviated allergic disease by regulating airway dendritic cells. Clin. Immunol. 129: 202-210. Soumelis, V., Y. J. Liu. 2004. Human thymic stromal lymphopoietin: a novel epithelial cell-derived cytokine and a potential key player in the induction of allergic inflammation. Springer Semin. Immunopathol. 25: 325-333. Pandey, A., K. Ozaki, H. Baumann, S. D. Levin, A. Puel, A. G. Farr, S. F. Ziegler, W. J. Leonard, H. F. Lodish. 2000. Cloning of a receptor subunit required for signaling by thymic stromal lymphopoietin. Nat. Immunol. 1: 59-64. Park, L. S., U. Martin, K. Garka, B. Gliniak, J. P. Di Santo, W. Muller, D. A. Largaespada, N. G. Copeland, N. A. Jenkins, A. G. Farr, et al 2000. Cloning of the murine thymic stromal lymphopoietin (TSLP) receptor: formation of a functional heteromeric complex requires interleukin 7 receptor. J. Exp. Med. 192: 659-670. Reche, P. A., V. Soumelis, D. M. Gorman, T. Clifford, M. Liu, M. Travis, S. M. Zurawski, J. Johnston, Y. J. Liu, H. Spits, et al 2001. Human thymic stromal lymphopoietin preferentially stimulates myeloid cells. J. Immunol. 167: 336-343. Al-Shami, A., R. Spolski, J. Kelly, T. Fry, P. L. Schwartzberg, A. Pandey, C. L. Mackall, W. J. Leonard. 2004. A role for thymic stromal lymphopoietin in CD4+ T cell development. J. Exp. Med. 200: 159-168. Watanabe, N., S. Hanabuchi, V. Soumelis, W. Yuan, S. Ho, R. de Waal Malefyt, Y. J. Liu. 2004. Human thymic stromal lymphopoietin promotes dendritic cell-mediated CD4+ T cell homeostatic expansion. Nat. Immunol 5: 426-434. Soumelis, V., P. A. Reche, H. Kanzler, W. Yuan, G. Edward, B. Homey, M. Gilliet, S. Ho, S. Antonenko, A. Lauerma, et al 2002. Human epithelial cells trigger dendritic cell mediated allergic inflammation by producing TSLP. Nat. Immunol. 3: 673-680. Sokol, C. L., G. M. Barton, A. G. Farr, R. Medzhitov. 2008. A mechanism for the initiation of allergen-induced T helper type 2 responses. Nat. Immunol. 9: 310-318. Ito, T., Y. H. Wang, O. Duramad, T. Hori, G. J. Delespesse, N. Watanabe, F. X. Qin, Z. Yao, W. Cao, Y. J. Liu. 2005. TSLP-activated dendritic cells induce an inflammatory T helper type 2 cell response through OX40 ligand. J. Exp. Med. 202: 1213-1223. Gilliet, M., V. Soumelis, N. Watanabe, S. Hanabuchi, S. Antonenko, R. de Waal-Malefyt, Y. J. Liu. 2003. Human dendritic cells activated by TSLP and CD40L induce proallergic cytotoxic T cells. J. Exp. Med. 197: 1059-1063. Watanabe, N., S. Hanabuchi, M. A. Marloie-Provost, S. Antonenko, Y. J. Liu, V. Soumelis. 2005. Human TSLP promotes CD40 ligand-induced IL-12 production by myeloid dendritic cells but maintains their Th2 priming potential. Blood 105: 4749-4751. Omori, M., S. Ziegler. 2007. Induction of IL-4 expression in CD4+ T cells by thymic stromal lymphopoietin. J. Immunol. 178: 1396-1404. Allakhverdi, Z., M. R. Comeau, H. K. Jessup, B. R. Yoon, A. Brewer, S. Chartier, N. Paquette, S. F. Ziegler, M. Sarfati, G. Delespesse. 2007. Thymic stromal lymphopoietin is released by human epithelial cells in response to microbes, trauma, or inflammation and potently activates mast cells. J. Exp. Med. 204: 253-258. Kato, A., S. Favoreto, Jr, P. C. Avila, R. P. Schleimer. 2007. TLR3- and Th2 cytokine-dependent production of thymic stromal lymphopoietin in human airway epithelial cells. J. Immunol. 179: 1080-1087. Ying, S., B. O'Connor, J. Ratoff, Q. Meng, K. Mallett, D. Cousins, D. Robinson, G. Zhang, J. Zhao, T. H. Lee, C. Corrigan. 2005. Thymic stromal lymphopoietin expression is increased in asthmatic airways and correlates with expression of Th2-attracting chemokines and disease severity. J. Immunol. 174: 8183-8190. Al-Shami, A., R. Spolski, J. Kelly, A. Keane-Myers, W. J. Leonard. 2005. A role for TSLP in the development of inflammation in an asthma model. J. Exp. Med. 202: 829-839. Zhou, B., M. R. Comeau, T. De Smedt, H. D. Liggitt, M. E. Dahl, D. B. Lewis, D. Gyarmati, T. Aye, D. J. Campbell, S. F. Ziegler. 2005. Thymic stromal lymphopoietin as a key initiator of allergic airway inflammation in mice. Nat. Immunol. 6: 1047-1053. Jessup, H. K., A. W. Brewer, M. Omori, E. A. Rickel, A. L. Budelsky, B. R. Yoon, S. F. Ziegler, M. R. Comeau. 2008. Intradermal administration of thymic stromal lymphopoietin induces a T cell- and eosinophil-dependent systemic Th2 inflammatory response. J. Immunol. 181: 4311-4319. Zhou, B., M. B. Headley, T. Aye, J. Tocker, M. R. Comeau, S. F. Ziegler. 2008. Reversal of thymic stromal lymphopoietin-induced airway inflammation through inhibition of Th2 responses. J. Immunol. 181: 6557-6562. Grencis, R. K., A. J. Bancroft. 2004. Interleukin-13: a key mediator in resistance to gastrointestinal-dwelling nematode parasites. Clin. Rev. Allergy Immunol. 26: 51-60. Cheever, A. W., K. F. Hoffmann, T. A. Wynn. 2000. Immunopathology of schistosomiasis mansoni in mice and men. Immunol. Today 21: 465-466. Cheever, A. W., M. E. Williams, T. A. Wynn, F. D. Finkelman, R. A. Seder, T. M. Cox, S. Hieny, P. Caspar, A. Sher. 1994. Anti-IL-4 treatment of Schistosoma mansoni-infected mice inhibits development of T cells and non-B, non-T cells expressing Th2 cytokines while decreasing egg-induced hepatic fibrosis. J. Immunol. 153: 753-759. Chiaramonte, M. G., D. D. Donaldson, A. W. Cheever, T. A. Wynn. 1999. An IL-13 inhibitor blocks the development of hepatic fibrosis during a T-helper type 2-dominated inflammatory response. J. Clin. Invest. 104: 777-785. Pesce, J., M. Kaviratne, T. R. Ramalingam, R. W. Thompson, J. F. Urban, Jr, A. W. Cheever, D. A. Young, M. Collins, M. J. Grusby, T. A. Wynn. 2006. The IL-21 receptor augments Th2 effector function and alternative macrophage activation. J. Clin. Invest. 116: 2044-2055. Reiman, R. M., R. W. Thompson, C. G. Feng, D. Hari, R. Knight, A. W. Cheever, H. F. Rosenberg, T. A. Wynn. 2006. Interleukin-5 (IL-5) augments the progression of liver fibrosis by regulating IL-13 activity. Infect. Immun. 74: 1471-1479. Coutinho, H. M., L. P. Acosta, H. W. Wu, S. T. McGarvey, L. Su, G. C. Langdon, M. A. Jiz, B. Jarilla, R. M. Olveda, J. F. Friedman, J. D. Kurtis. 2007. Th2 cytokines are associated with persistent hepatic fibrosis in human Schistosoma japonicum infection. J. Infect. Dis. 195: 288-295.
de Jesus, A. R., A. Magalhaes, D. G. Miranda, R. G. Miranda, M. I. Araujo, A. A. de Jesus, A. Silva, L. B. Santana, E. Pearce, E. M. Carvalho. 2004. Association of type 2 cytokines with hepatic fibrosis in human Schistosoma mansoni infection. Infect. Immun. 72: 3391-3397. Ramalingam, T. R., J. T. Pesce, F. Sheikh, A. W. Cheever, M. M. Mentink-Kane, M. S. Wilson, S. Stevens, D. M. Valenzuela, A. J. Murphy, et al 2008. Unique functions of the type II interleukin 4 receptor identified in mice lacking the interleukin 13 receptor α1 chain. Nat. Immunol. 9: 25-33. Wynn, T. A., A. W. Cheever, D. Jankovic, R. W. Poindexter, P. Caspar, F. A. Lewis, A. Sher. 1995. An IL-12-based vaccination method for preventing fibrosis induced by schistosome infection. Nature 376: 594-596. Leonard, W. J.. 2002. TSLP: finally in the limelight. Nat. Immunol. 3: 605-607. Yoo, J., M. Omori, D. Gyarmati, B. Zhou, T. Aye, A. Brewer, M. R. Comeau, D. J. Campbell, S. F. Ziegler. 2005. Spontaneous atopic dermatitis in mice expressing an inducible thymic stromal lymphopoietin transgene specifically in the skin. J. Exp. Med. 202: 541-549. Anthony, R. M., L. I. Rutitzky, J. F. Urban, M. J. Stadecker, W. C. Gause. 2007. Protective immune mechanisms in helminth infection. Nat. Rev. Immunol. 7: 975-987. Sabin, E. A., M. A. Kopf, E. J. Pearce. 1996. Schistosoma mansoni egg-induced early IL-4 production is dependent upon IL-5 and eosinophils. J. Exp. Med. 184: 1871-1878. Chiaramonte, M. G., L. R. Schopf, T. Y. Neben, A. W. Cheever, D. D. Donaldson, T. A. Wynn. 1999. IL-13 is a key regulatory cytokine for Th2 cell-mediated pulmonary granuloma formation and IgE responses induced by Schistosoma mansoni eggs. J. Immunol. 162: 920-930. Wynn, T. A., R. W. Thompson, A. W. Cheever, M. M. Mentink-Kane. 2004. Immunopathogenesis of schistosomiasis. Immunol. Rev. 201: 156-167. Rutitzky, L. I., J. R. Lopes da Rosa, M. J. Stadecker. 2005. Severe CD4 T cell-mediated immunopathology in murine schistosomiasis is dependent on IL-12p40 and correlates with high levels of IL-17. J. Immunol. 175: 3920-3926. Chiaramonte, M. G., A. W. Cheever, J. D. Malley, D. D. Donaldson, T. A. Wynn. 2001. Studies of murine schistosomiasis reveal interleukin-13 blockade as a treatment for established and progressive liver fibrosis. Hepatology 34: 273-282. Holgate, S. T.. 2007. The epithelium takes centre stage in asthma and atopic dermatitis. Trends Immunol. 28: 248-251. Huston, D. P., Y. J. Liu. 2006. Thymic stromal lymphopoietin: a potential therapeutic target for allergy and asthma. Curr. Allergy Asthma Rep. 6: 372-376. Frohlich, A., B. J. Marsland, I. Sonderegger, M. Kurrer, M. R. Hodge, N. L. Harris, M. Kopf. 2007. IL-21 receptor signaling is integral to the development of Th2 effector responses in vivo. Blood 109: 2023-2031.